Johnston Foster (American), BuzzKill, 2017. Coroplast, wood glue, aluminum roofing, garden hose, flexible drainage tubing, extension cords, inner tubes, PVC pipe, surgical tubing, hot glue, electrical wire, glass marble, furniture moulding, Rubbermaid trash can, insulation foam, plastic construction netting, plastic kiddie pool, plastic drainage pool, steel wire, melted plastic table cloth, Styrofoam, acrylic paint, plywood, spray paint, steel construction studs, coaxial cable, drywall screws. Commissioned by 21c Museum Hotel, BuzzKill is an immersive, site-specific installation by Nova Scotia-based artist Johnston Foster. 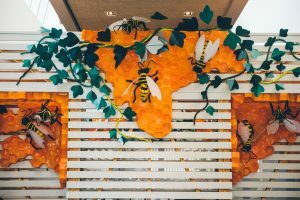 Installed throughout The Hive restaurant at 21c Bentonville, the work transforms the restaurant into a work of art itself, with glowing honeycomb, kudzu vines, swarms of bees, and random hidden objects and creatures interspersed throughout the lounge and dining spaces. BuzzKill references the folklore and fauna of Bentonville and Northern Arkansas, and explores the environmental crisis currently facing the honeybee and other species worldwide. “Initially, I was concerned that the fauna and insect components intertwined with the honeycomb and vine elements would be perceived as purely decorative. My approach to dealing with these concerns was to infuse the installation with other elements that are less obvious at first glance, and which would create opportunities for exploration and personal interpretation. I also played with scale, intentionally exaggerating some elements in size; some of this resulted solely from the materials themselves, not my direct intention. In hindsight, the play on scale creates a hallucinatory atmosphere and challenges viewers’ preconceptions of reality and associations to familiar imagery. The added objects and creatures, like skulls, multi-headed birds, giant rats, sets of keys, and a human heart, for example, create a sense of a post-apocalyptic, post human environment. These objects act as clues to a mystery that is ultimately never resolved. The vine and honeycomb create a visual bombardment of color and contrast organic contour with geometric symmetry. The vibrant yet contrasting color palette is whimsical and celebratory. The bees initially may be viewed as “cute” or inviting, but the saturated colors of the environment contrast with their insidious, invasive nature. The more macabre elements like the skulls and dismembered body parts suggest a darker, more treacherous narrative, yet the meaning of BuzzKill remains open-ended. When the installation was completed, it became clear that the restaurant’s patrons and visitors are an essential element of the artwork. Without audience participation within the space it remains stagnant and purposeless. Artworks can be observed through reproduction or from afar, but the activation and true essence of the work is only found through viewer participation. My process of collecting, salvaging, and creating through an alchemic approach to object-making can in part be understood as a necessity driven by an art practice in which immediate and local resources influence the imagery and understanding of the finished results. It also can serve as a metaphor for survival and adaptation techniques found in the natural world, and in the imagery and subject matter that inspires and results from my art production. BuzzKill is the most complex and elaborate exploration of both these approaches within my practice to date. The layers of formal material manipulation of discarded, surplus, and manufactured objects coupled with multitudes of imagery from the natural world create a unification of process and concept that I actively yearn for in my work that is rarely achieved and often unintentional when accomplished. Johnston Foster received his BFA from Virginia Commonwealth University in 2001 and an MFA from Hunter College in New York in 2005. In 2003, he completed a residency at the Skowhegan School of Painting & Sculpture. Foster has exhibited in group and solo shows at MoMA PS1; Kidspace at MASS MoCA; Yerba Buena Center for the Arts; Brigham Young University Museum of Art; University Galleries of Illinois State University; Cress Gallery of Art at The University of Tennessee at Chattanooga; Centre d’art Bastille, Grenoble France; and Virginia Museum of Contemporary Art, among others. Foster’s work is in many prestigious public and private collections and has been featured in galleries across the globe including RARE gallery, New York City; The Blender Gallery, Athens, Greece; Galería Christopher Paschall, Bogota, Colombia; and galerieXprssns, Hamburg, Germany. Foster works and lives with his family in Halifax, Nova Scotia, Canada.